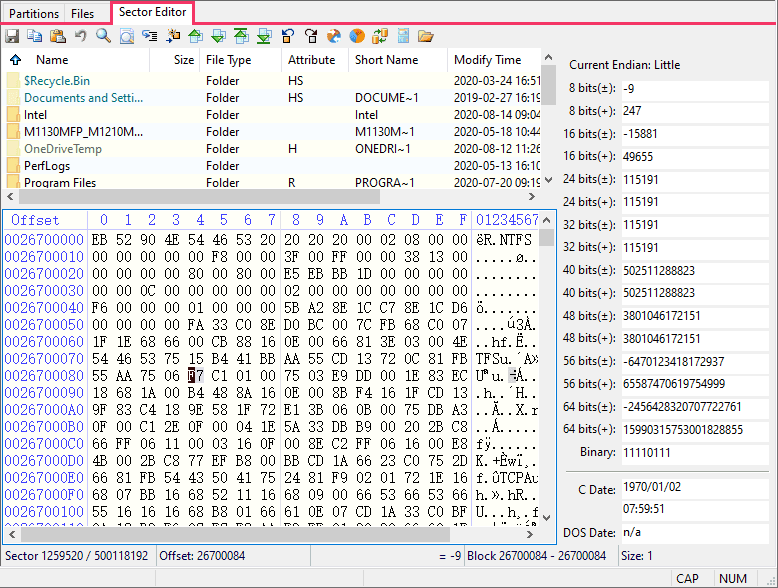 DiskGenius includes a hex editor which can be used by advanced users to fulfill various tasks such as data recovery, file analyzing, editing data structure, cloning disk, etc. If you do not have a good command of related knowledge, do not try this function in case any improper operation damages data. 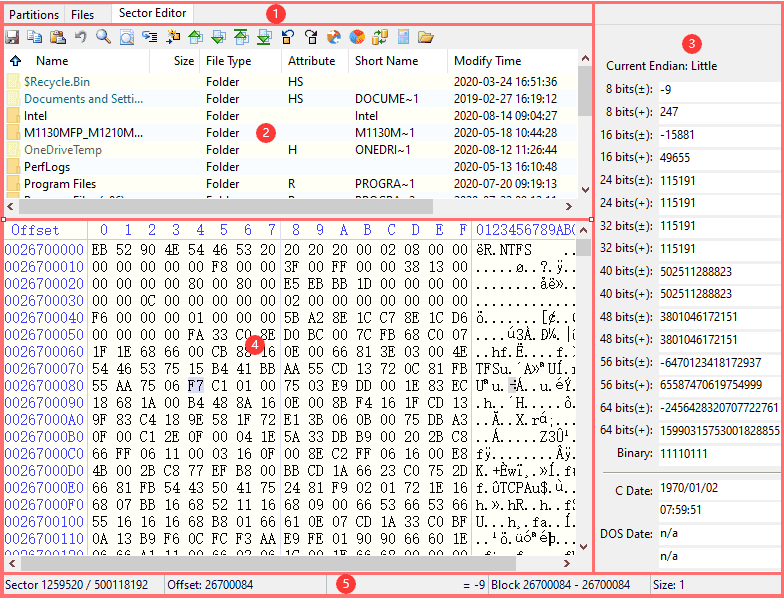 Run DiskGenius, select a partition and click the tab "Sector Editor" to launch sector editor. From left to right: save, copy, paste, undo, find hex values, find text, go to offset, go to sector, last sector, next sector, go to first sector, go to last sector, last cursor, next cursor, interpret as partition start, endian convert, calculator and directory browser. This part shows files and folders of the partition whose sectors are being edited. The place of currently selected item can be reached by using context menu (e.g. beginning sector of file, file record, index, parent directory record, directory entry and beginning sector of parent directory). Double click the folder to visit its files and click the mark ".." to return to parent directory. 1) Signed and unsigned (8 bit, 16 bit, 24 bit, 32 bit, 40 bit, 48 bit, 56 bit, 64 bit). 2) GUID: GUID (Global Unique Identifier) is a 128-bit number identifier produced by algorithm. 3) Time and date: C Date is a 32-bit integer value, representing seconds since January 1, 1970; DOS Date is used by several DOS function calls and by all FAT file systems, and the lower word determines the time, the upper word the data; FILETIME is a 64-bit integer value representing the number of 100-nanosecond intervals since January 1, 1601. Used by the Win32 API. This area divides into three parts: offset area, hex edit area and text edit area. Mouse dragging is supported. Changed part will turn red, otherwise keeps black. 1) Offset area: show address in hex. 2) Hex edit area: user can enter characters (0-9 and A-F). 3) Text edit area: user can enter characters (ASCII). This area shows the current sector and sector count, offset, interpretation of current cursor, range of selected blocks and block size. Also, it supports copying through right mouse button (hex and decimal).